Odell Beckham’s versatility isn’t just about his special teams play. Photo by Crawford Orthodontics. Some schools are known for producing good athletes whose games don’t translate to the NFL. LSU’s Beckham doesn’t fit that pattern. Craig “Buster” Davis. Devery Henderson. Early Doucet. Brandon LaFell. Terrence Tolliver. These five receivers were good college players at LSU who failed to develop into productive starters that an NFL team feels it’s “set” at that spot in its lineup. Dwayne Bowe (and it was shaky for a bit) and Rueben Randle are the two exceptions in recent years. Despite the fact that LSU has a history of recruiting great athletes whose physical skills tempt scouts and NFL personnel directors into selecting them only to earn a lower return on investment than they hoped, it’s never a good idea to write off a program or a group of players based on this recent trend. Every player is different – even if the trend seems to be strong. It’s important to examine each player as an individual and not let past players from that program influence the decision-making process. Otherwise, evaluators can fall into the trap of following the back end of trends, which is a lot like following the back-end of a horse. 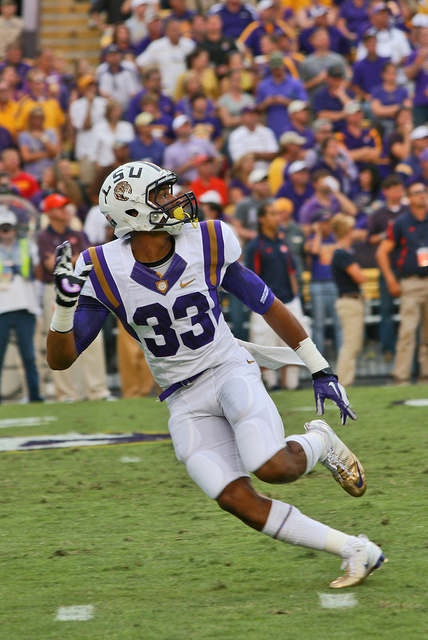 LSU’s starting receivers are two prospects that I like this year – especially Odell Beckham. The 6’0″, 187-pound junior may lack the prototypical height and weight of an NFL primary receiver, but he plays big and he’s versatile. Here are six plays that do a good job highlighting Beckham’s game at this stage of his career. No.1 – Beckham Is A Football Player First, Receiver Second. If I was a head coach, personnel director, general manager, or owner of a team, one of the first qualities I would demand of my players is a comfort level with physical play. Julius Thomas is a physical freak at eight end, but his reputation – fair or not – is that he doesn’t respond well to physical play. On the other hand, Hines Ward was a Timex. I haven’t seen Beckham make or take any Ward-like hits, but a running theme throughout his game is the willingness to engage in the physical side of the game. Here’s the first play of the LSU-TCU game. Beckham is at the top of the formation between the left hash and left flat with the cornerback playing a yard off on this run play to the receiver’s side. The fact that LSU is comfortable running to Beckham’s side in a 21 personnel 1×1 receivers set is a testament to Beckham as a run blocker. Beckham delivers an excellent punch with good hand placement. He integrates his hand use and leg drive to shove his opponent off the line of scrimmage. It’s not a perfect block – Beckham over-extends his form during the block and allows the cornerback to turn outside and get up field. The receiver manages to counter with a shove that prevents the defensive back from reaching the runner. If a player is going to make an error in the run game, I’d rather him be too eager to get physical than not eager enough. Beckham fits the bill. A kick or punt return can tell an evaluator a lot about a player’s style as a ball carrier. This return against TCU with 13:26 in the half tells me that Beckham’s running style is confident, intelligent, agile, explosive, and physical. Beckham takes this kick seven yards deep in the end zone. The fact that there’s no hesitation about running this out is a positive. He’s confident in what he sees as well as his ability to execute. I like that he sets up his first move by bending the run inside the right hash to the five to set up the wall of three blockers ahead. This is much like a running back pressing and cutting back. Beckham’s cut back is sharp enough to get outside the wall and force the unblocked defender coming up the sideline to take a bad angle. Beckham then layers moves to get outside a defender coming over top at the 20. First, it’s a hop-step inside and followed with a break to the outside. These moves get Beckham to the 20 and then to the 25. The receiver throws another combination of moves into the run, executing a stutter-step to set up a swat of the inside pursuit with this left arm that takes the defender to the ground. Like the block, Beckham is the player attacking and not being attacked. He finishes the play lowering his pads into a defender and continues forward another three yards. Beckham’s ability to layer confidence, savvy, agility, and physicality into his game makes him the type of player I can use all over the field: the end-around, screens, special teams, and traditional timing routes. This is a simple-looking post route that Beckham catches for a 42-yard gain against TCU on 1st and 10 with 0:16 in the first quarter as the outside twin man on a strong side twin I formation set. Both receivers are running posts on this play. What I like about his play is Beckham’s patience. Watch the replay and you’ll see that he runs a long stem and continues his trajectory towards the cornerback. There’s no real set-up with movement to try to get the defender to bite. Beckham knows this corner is patient and not biting because he’s playing six yards off with no safety help. The receiver maintains his path that will eventually force the defender to give up the inside or collide with Beckham. Late in the stem, the defender blinks just enough for Beckham to break inside. This straight path that Beckham takes a nice sign of good speed that he can run a true linear route and earn separation without a head fake, stutter or dip. If not for an under-thrown ball, Beckham had the separation to run under this pass for a touchdown. Beckham has to wait on the ball, but he still manages to make the catch with his hands and maintain possession with the corner wrapped around his waist. Winning against tight coverage is also a recurring theme for Beckham – another sign that he’s comfortable with physical play. The last play was a good example of Beckham displaying patience as a route runner. This play illustrates that Beckham can win early and do so with an integration of physicality and agility. This is a 1st and 10 with 8:39 in the half from a 21-personnel, 1×1 receiver I-formation set at the 45 of LSU. The TCU cornerback is a yard of the line of scrimmage. Beckham is a yard behind the line in the left flat between the hash and the numbers. When a receiver lines up 3-4 yards behind the line of scrimmage on a consistent basis, it’s a good indication that the offense is trying to prevent that player from getting pressed because they don’t have confidence in his skills to win early. Beckham is just a yard off the line and he uses that space to dictate the action. He executes a strong stutter-step and pairs it with his outside arm to rip past the corner back, earning two yards of separation on the man within the first five yards of the release from the line of scrimmage. That’s a lot of space for a receiver to earn this early in a route. Austin Collie was fantastic at doing this at BYU and before his rash of injuries with the Colts. I bet Beckham will display similar initial quickness and more top-end speed. On this play, the receiver is wide open but quarterback Zach Mettenberger once again under-throws the target. The pass is a 49-yard throw from pitch to catch, but needed to be 50-52 yards in length for Beckham to run under it with his back to the defender. Instead, Beckham has to wait on the ball, the corner back recovers, and Beckham loses concentration, trying to turn up field before he has fully secured the target. The ball bounces off Beckham’s hands, and the corner arrives just in time to pry the receiver’s arms away from any second-effort attempt. The end result is a negative, but I’ve seen enough plays where Beckham makes these types of catches – including more difficult ones – that it doesn’t outstrip the positive of this wide receiver’s skill to earn separation early in a route. A play like this tells me that Beckham can help a team in a short timing game with heavy west coast principles or a vertical game that relies on a lot of play action. His versatility as a receiver is just as important as his versatility as a football player. Earlier this year, I profiled Jordy Nelson’s ability to frame separation with a defensive back. Beckham flashes similar technique on this 2nd-and-11 pass with 2:36 in the half from a 1×1 receiver, 21 personnel I-formation set as the single receiver on the left side. Once again he’s a yard behind the line of scrimmage with the cornerback playing three yards off with outside shade. At the top of his stem, Beckham takes a hard step into the body of the defender, frames separation with his hands, and then makes a quick break outside. I love how he comes back to the ball, attacking the target with a leaping catch at the sideline while the defender wraps him. The hand strength to maintain possession on this play is impressive as is keeping both feet in bounds. This is an example why the dropped-post pattern is a “concentration drop.” Too many of these, and it’s a problematic thing for a receiver’s evaluation. However, in the context of what else I’ve seen – like this play – it’s not a concern. In this game alone Beckham has attacked early, remained patient and kept it simple, and attacked late. This route is an example of Beckham using yet another press technique on a route further highlights his athleticism and concentration: the fade-stop. Beckham is the single receiver at the numbers of the left side of the field facing a cornerback playing four yards off with inside shade and a safety 10 yards deep and just inside the left hash. I like the swim move to break outside and get an early step on the cornerback, baiting the defender to consider a deeper route before breaking back to the ball. Beckham once again makes the reception after sustaining some contact from the defender. Like Greg Jennings, Isaac Bruce, or Tim Brown, Beckham is an average-size receiver who possesses the athleticism, toughness, technique, and savvy to play bigger than his measurements. It’s why he’s a favorite of mine in this draft class even if his alumni haven’t shined as brightly in the NFL as some anticipated. For analysis of skill players in this year’s draft class, download the 2014 Rookie Scouting Portfolio.The 2014 RSP will available April 1 and if you pre-order before February 10, you get a 10 percent discount. Better yet, if you’re a fantasy owner the 56-page Post-Draft Add-on comes with the 2012 – 2014 RSPs at no additional charge and available for download within a week after the NFL Draft. Best, yet, 10 percent of every sale is donated to Darkness to Light to combat sexual abuse. You can purchase past editions of the Rookie Scouting Portfolio for just $9.95 apiece. We really like Beckham too- a couple of our scouts have him as the #2 WR in this class. What’s with all this talk about alumni not shining bright? Show me a school who shines brighter. Tyran Mathieu, Patrick Peterson, Steven Ridley, Kyle Williams, Perry Riley, Kelvin Sheppard, LA Ron Landry, Corey Webster, Anthony McFarland, Faneca, Michael Brockers, Brady James, Kevin Faulk, Eric Reid, Barkevious Mingo. That’s off the top of my head… Come on man. And Devery Henderson didn’t produce for the Saints? Thanks for reading. At the same time I must point out that I was referring to the WR position only. Henderson is a nice contributor, but he’s not a starting-caliber WR. I’m glad you have much love for your team, but I’m not attacking the quality of LSU’s program. I’m simply pointing out that the majority of WRs who were recently drafted haven’t developed into quality starters that a team’s front office would say “it’s set” at that roster spot and wouldn’t consider drafting a potential replacement. Of course, when fan boards and sites of college teams link to my work, which is always nice to see, I inevitably get the “super fan” who feels like he has to talk about how great his team is. LSU has a terrific program and all those non-WRs you mentioned are excellent examples of successful pros. I was talking about WRs. And despite the fact most of the players I mentioned haven’t been quality starters a team feels like it can build around, it’s not a criticism of the program unless you think the sole purpose of LSU’s team isn’t to win college football games, but produce NFL players. That would be a little backwards, wouldn’t it? Looove me some Odell Beckham. Easily one of my favorite current Bayou Bengals. As with most wideouts, I think landing spot is going to be key for him in the NFL. I also hope scouts don’t erroneously saddle him with the dreaded “slot WR only” tag because of his size. Guy can ball, inside or out. I noticed that on a few of the QB sacks that Beckham didn’t seem to make route adjustments when the DB was blitzing. Just wondering if this is something he should have been aware of or if this was the QBs responsibility and if so, does he struggle with his reads? Thanks! This is something that someone close to LSU or tied to the coaching staff would only know (QB responsibility? Joint responsibility?). Most receivers entering the NFL have to adjust to the complexities of the pro game. I would not be overly concerned about route adjustments at this stage for a prospective rookie. I’d be more concerned if he can’t catch, has difficulty with the fundamental route concepts of releases, stems, or breaks, or he can’t catch the ball in traffic/handle physical play. The route adjustments are a nuance of the game that should come with study.